A cyst is a small, fluid-filled sac that forms a visible lump. Cysts often occur on the top or bottom of the wrist and on the fingers. They are typically anchored in place but when pressed can be moved very slightly. The precise cause of a ganglion cyst is unknown. More often than not, they are in areas with tendons and joints nearby. A ganglion cyst can change size and shape over time. They are benign (noncancerous) and cannot spread to other areas of the body. So what exactly is a cyst? A cyst is a small, fluid-filled sack that forms a visible painless lump. 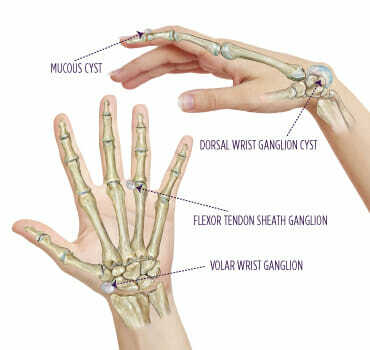 Cysts most often occur on the top or bottom of the wrist and on the fingers. They are typically anchored in place, but when pressed are soft and can be moved very slightly. A ganglion cyst can change size and shape over time. The precise cause of a ganglion cyst is unknown although they are typically seen in areas where tendons and joints are in close proximity. A cyst usually first appears as a lump in the wrist or hand. These lumps have a range of characteristics. They can be soft or firm, large or small, and tender or painless. 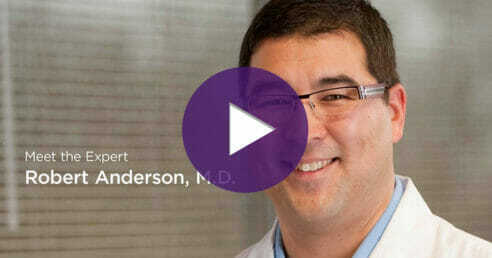 If the cyst increases in size, it may put pressure on adjacent tendons, nerves, and joints. This may eventually cause discomfort and even pain. A ganglion cyst can be diagnosed through a physical examination. Your specialist may wish to get X-rays to determine if there is an underlying cause of the ganglion. Collectively, this information will help your hand specialist formulate a treatment plan tailored to your needs. What can I expect the results to be after treatment? Your ganglion cysts may recur after treatment or they may disappear altogether. Knowing there are treatment options available, and that the cysts are not cancerous and do not spread, will help you better understand their nature and allow you to get back to your everyday, active life.